Dipty dear Jai Sai Ram....Nice to see your confessional pleadings. I will say........Go ahead and do it, it is easier to apologize than to get permission from MY BABA SAI. Neither HE encourages us to do those vices nor HE stops us from them. HE has given us free will to do whatever we like to do. I too used to smoke but once I got to know its ill effect on my health I stop smoking at once without any second thought on it and its almost 6 years now I haven't touched the cigarettes. If you have will and if it effects your health adversely than its upto you to decided whether to continue smoking and drinking or to leave it. Yeh Tumahare Iccha Shakti par depend karta hai....BABA SAI Ko Hamesha Apni Madad Mein Tatpar Paogi. I don't think anyone can force me to smoke or drink unless and untill I am ready. So be bold to say inner 'No'. MY BABA SAI only helps Braves Souls and I know you are in the making of that Brave Soul. Your inner knows and feels that these are not good for you. Come on! Keep it up. You can do it. Lastly take it granted....HE never ever punishes. MY BABA SAI is Dayalu....Kripalu.....Despite of all our ill things HE still loves us 'AS IS WHERE IS BASIS'. OMSAIRAM!Dipty dear WElcome to our Sai Mandir of blessed Ravi bhai. BABA can forgive killing of even 1000 brahmins..as we sing in the kakad AARTI. DEAR YOU ARE JUST AN INNOCENT CHILD OF OUR SAI MAA. BABA LIKE A LOVING MOTHER WILL GUIDE ALL OF US. TELL ME WHO HAS NOT SINNED OR HURT SOMONE. WE ALL SINNERS BUT WE HAVE THE MERIT TO BE SAI DEVOTEES. BABA HAS ENROLLED US IN HIS SCHOOL..HE IS OUR GURU,OUR GUIDE WHO WILL LEAD US TO THE FINAL ABODE. 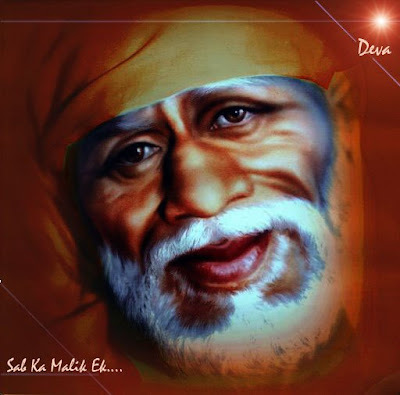 SADGURU LIKE SAI BABA OPEN OUR EYES OF INTELLECT AND GIVE US DISCRIMINATION B/W THE REAL AND UNREAL. I PRAY TO BABA TO GUIDE US ON HIS DAY GURUWAAR SO WE MAY TREAD RIGHT PATH. He wont punish you - We pray that Sai baba gives you strength and he blesses you !!! Om Sai Ram..You have made a conscious effort to correct yourself. And Baba will surely help you. HE never punishes HIS children. HE will surely help you. Dont worry. First and foremost,let me congratulate you for your guts to confess in a open for all forum.you are really brave ,dear sister and kicking out your unwanted habits should not be a big deal for you.You can definitely do it and Baba will bless you with his grace to do it. baba may bless you with best of worlds. you are his precious lovely child you love him so much . so he will be always with you and guide. one thing babba encouraged is always to first offer to him before we drink or eat or do anything. we can offer only good things to baba. in that way there is no chance to go for bad. so from now whenevr you wnat to do smoke or drink think of baba . can you offer it to him? wiht out offering to him can you enjoy ? you being his lovley child can't do anything without offering to him. practice this. soon you will quit all th bad habits. you already through. As you makes your children commits mistakes, it means you are making them to realise & letting them to come out of it. so i hope you can help goel to come out of her bad habits. please raksha karo dayalu baba.